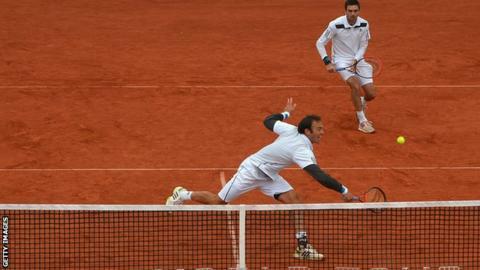 British pairing Colin Fleming and Ross Hutchins are through to the doubles final of the BMW Open in Munich. They beat Dustin Brown of Germany and Julian Knowle of Austria 6-3 6-2 in the semi-final of the ATP World Tour event and will meet fellow Briton Jamie Murray in Sunday's final. Murray and Australian John Peers beat Eric Butorac and Raven Klaasen 7-6 6-2. The men's singles final will see number one seed Fabio Fognini of Italy play Martin Klizan of Slovakia.